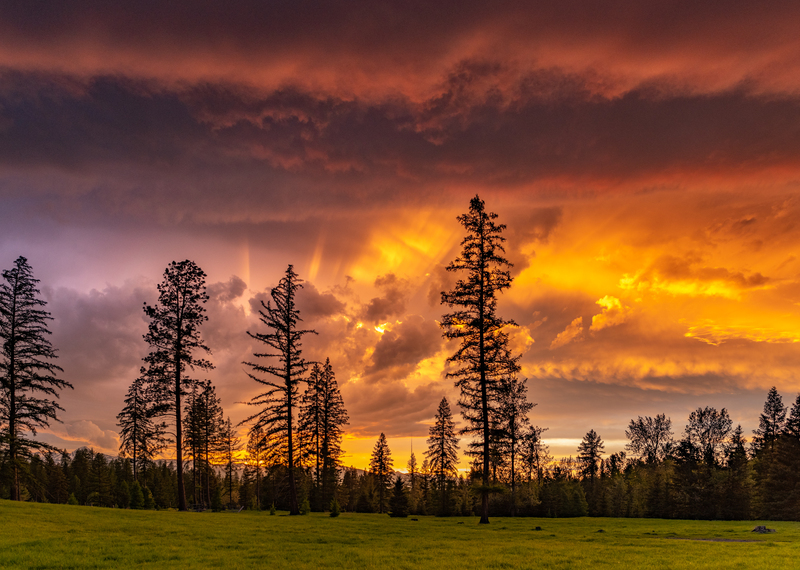 Two Elks Ranch in the Crown of the Continent experienced a spring sunset light storm in Montana’s Swan Valley at the end of May. Strong winds, rain and swirling clouds presented a challenge to be in and shoot. Epic storm blows in over the old homestead. 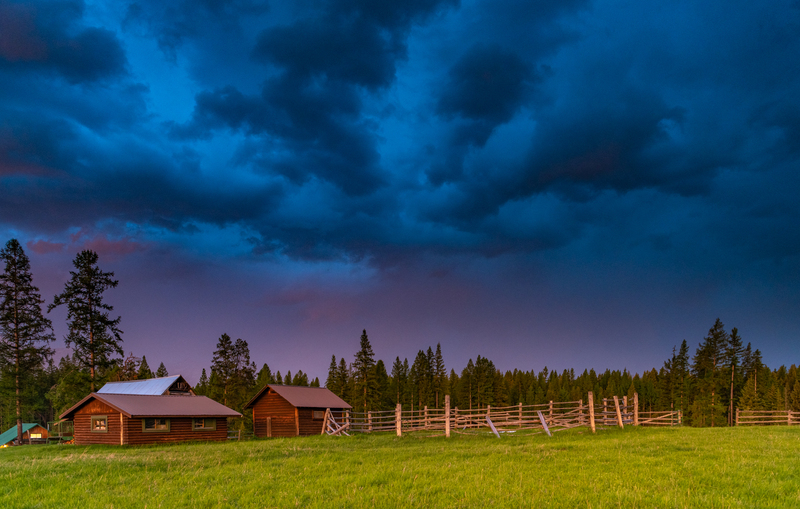 This grateful photographer took his camera and walked out into the pasture that evening at 9:00, in the rain under the most dark threatening cloud bristling with lightning. It was an act of hope, maybe faith and perhaps stupidity. 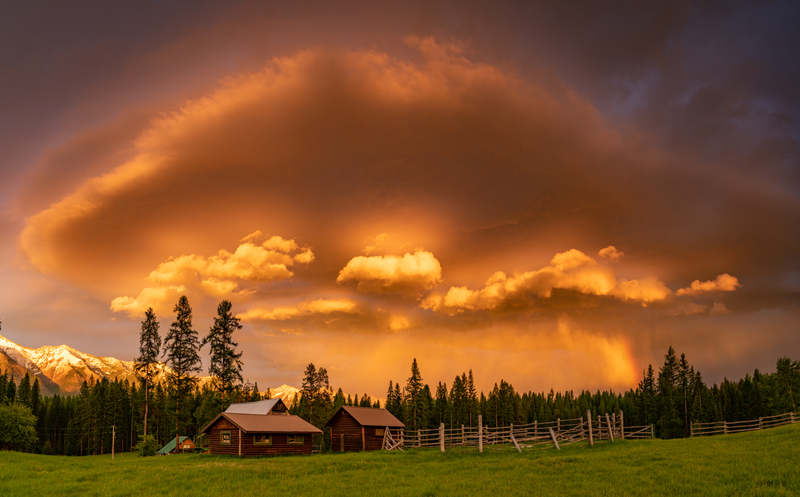 But then the storm started to swirl around the ranch and develop colors and cloud formations never before seen that took his breath away. From 9:00 to 9:29 he spun the camera on the tripod around in 360 degrees capturing 89 images. As the storm clouds and colors grew so did the wind. It was so strong he had to hold his 20 pound tripod/camera rig down with one hand while shooting. There were colors in every direction with high winds, rain and clouds full of sunset light. He was spinning around the tripod shooting as fast as he could. Sometimes using a timed exposure as it was sunset dark, sometimes with timed exposure and graduated neutral density filters, and sometimes higher ISO. But all the time he kept capturing images of the amazing sky as it glowed and changed. Toward the end it began raining so hard with thunder and lightning all around, he had to wipe the lens off for every shot. The amazing storm lasted for 33 minutes. 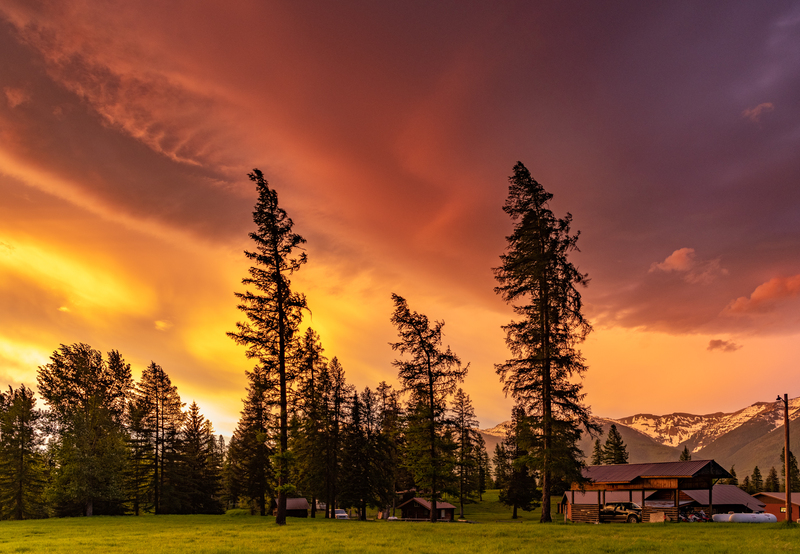 During that time, out of the 89 images he captured, many were sequenced into giga pixel panoramas like these that can be printed 60 inches wide or wider. The end result is a 48 image gallery, an amazing gift from a sunset storm in the Swan Valley.